The under-representation of women in justice system institutions and its impact on justice system outcomes were the focus of a Women’s Power Breakfast in Warsaw on 19 September 2018, during the OSCE Human Dimension Implementation Meeting. 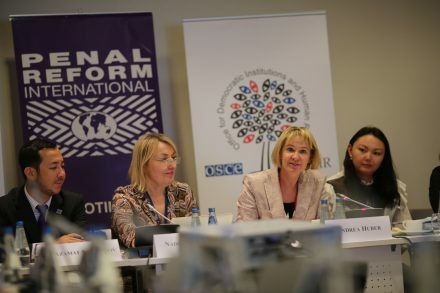 The event was co-organised by Penal Reform International, the OSCE Office for Democratic Institutions and Human Rights (ODIHR) and the United Nations Office on Drugs and Crime (UNODC) to promote women’s equal representation among staff of justice institutions and to advocate for gender-sensitive justice systems. Participants elaborated on how the under-representation of women in justice system institutions, as is the case in many countries, has a negative impact on numerous aspects of justice proceedings and contributes to gender discrimination. The experiences of female victims of gender-based violence in a predominantly male justice and penitentiary system were highlighted by many participants in the discussion. Azamat Shambilov, Regional Director of PRI’s Central Asia Office, noted that prison systems are usually male-dominated, and female staff frequently face harassment and barriers to promotion to managerial posts. ‘International standards require that female prisoners are supervised by female staff. This is essential to achieving gender-sensitive treatment of female detainees, including the prevention of gender-based violence in prisons,’ he said. The event saw the presentation by ODIHR of a discussion paper examining gender and diversity among justice system actors in terms of recruitment and workplace equality, as well as in terms of the fairness of outcomes, as perceived by end users of the justice system. The paper is part of ODIHR’s work to support participating States in implementing OSCE commitments relating to the rule of law and the comprehensive gender mainstreaming strategy of the organisation. This article was originally published on ODIHR’s website.